Home Styles Biscayne 5-Piece Set includes 48-inch Round Outdoor Dining Table and Four Swivel Chairs. Set is constructed of cast aluminum with a White finish. Features include powder coat finish sealed with a clear coat to protect finish, attractively patterned table top has center opening to accommodate umbrellas, and nylon glides on all legs. The Coopersmith 3 Piece High Dining Bistro Set offers a great option for small space dining. Set includes 2 swivel chairs with an olefin seat cushion and lumbar pillow, and a slat top bistro table. The table includes an umbrella hole. 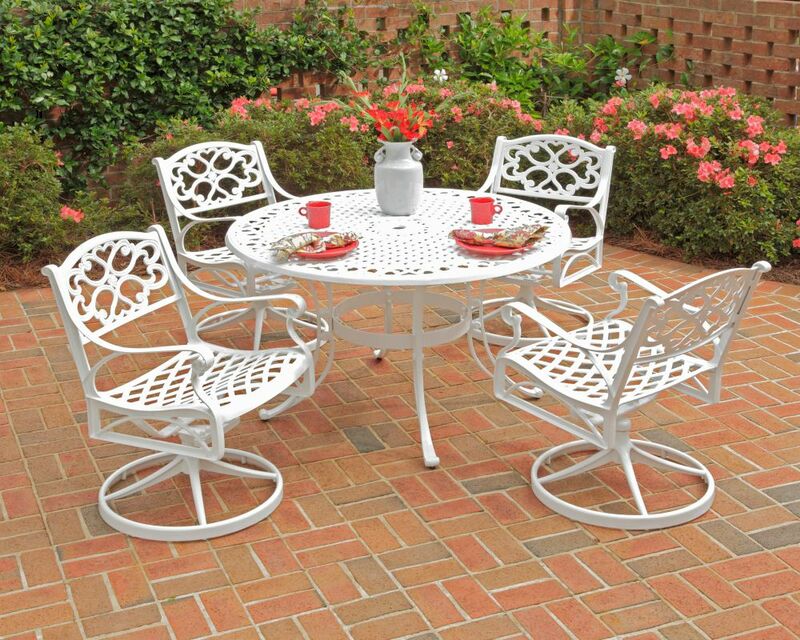 Gather with friends and family and dine with the Elm Court Steel 7pc sling C-Spring dining set. The Hampton Bay set includes 6 C-spring motion chairs with sling fabric and a 64 inch x 38 inch slat dining table with an umbrella hole. Chairs have a decorative header for an elegant design. Biscayne 5-Piece Patio Dining Set with 48-inch White Table and Four Swivel Chairs Home Styles Biscayne 5-Piece Set includes 48-inch Round Outdoor Dining Table and Four Swivel Chairs. Set is constructed of cast aluminum with a White finish. Features include powder coat finish sealed with a clear coat to protect finish, attractively patterned table top has center opening to accommodate umbrellas, and nylon glides on all legs.